There are some real stunners for you to see in the Fuqua Orchid Center right now. And they aren't even part of the Orchid Daze display. 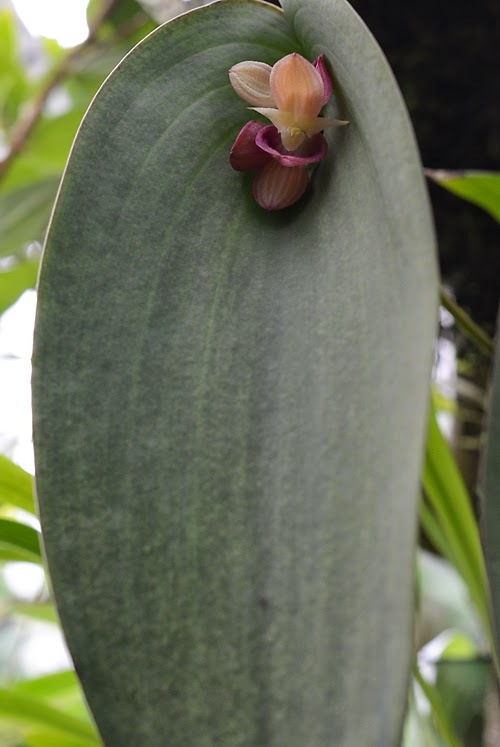 Like this plant, my own personal heartthrob, Pleurothallis cyanea. It is part of our permanent collection. What is it about this plant? Maybe it's the subtle blue-grey (cyanea means blue) tint of the leaves. Or their elongated heart shape. Or the geometry of those arching veins. It achieves perfection, even when it's not in flower. Oh yeah, the flowers. They seem to emerge, unexpectedly, near the top of the leaf. (Actually, they emerge where the stem meets the leaf, at the angle formed by the two rounded basal lobes.) The lower half (actually, two sepals, fused) of the 'clamshell' is concave, and rosy pink. They are elegant in their simplicity. 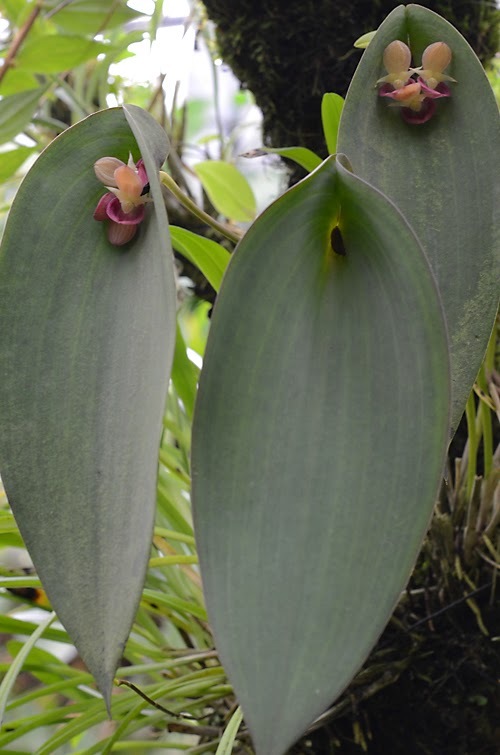 Pleurothallis cyanea is native to Colombia, where it grows as an epiphyte in wet tropical forests. 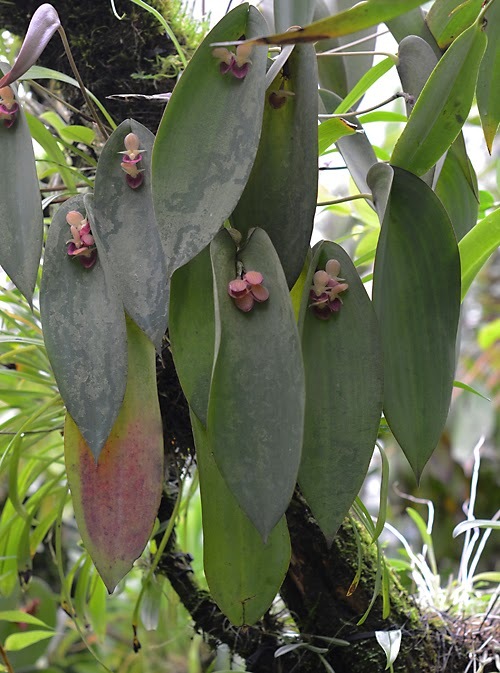 Our plants are mounted on trees in the Tropical High Elevation House, placed where they receive lots of shade. 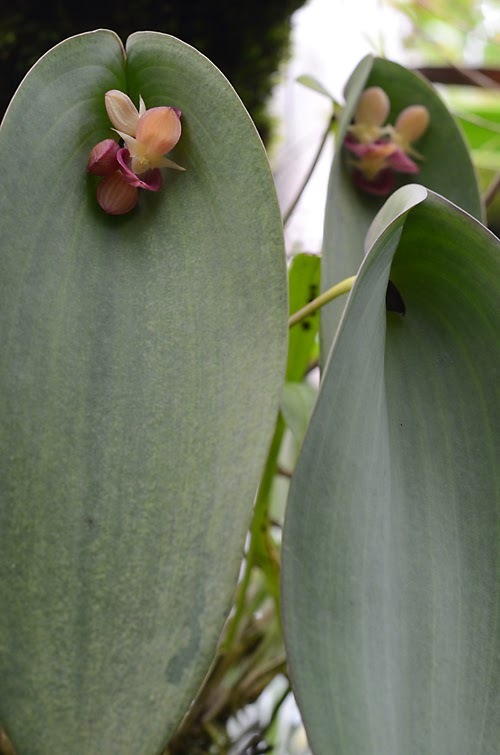 For some reason, just about all of our large-flowered Clamshell Orchids (Pleurothallis subg. 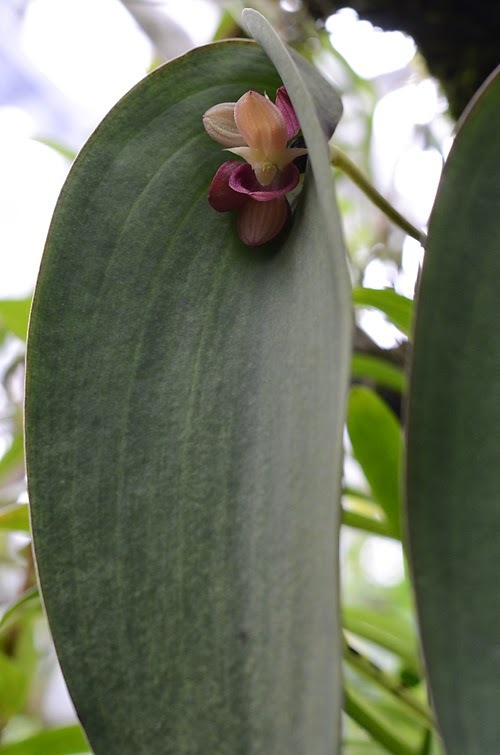 Pleurothallis section macrophyllae-fasciculatae): Pleurothallis cyanea, P. marthae, P. gargantua, P. teaguei and P. titan are all flowering simultaneously. Now is a great time to see this terrific group.